The Millennium Collection from DEKOR™ takes mood lighting to a whole new dimension with small yet powerful LED lights that offer reliability, function and style, indoors or out. Our signature LED recessed lights are perfect for outdoor decks, docks, and patios. Install them indoors in floors, stairs, or even under cabinets -- wherever accent lighting is desired. DEKOR premium quality LED recessed lights emit a clean warm white light, the ambience of incandescent lighting, but in a small energy efficient package. They are dimmable, waterproof, easy to install. DEKOR LED lighted post caps , post lights and post lamps add elegance, ambiance, safety, and security to your deck, dock, patio, garden, or back yard. 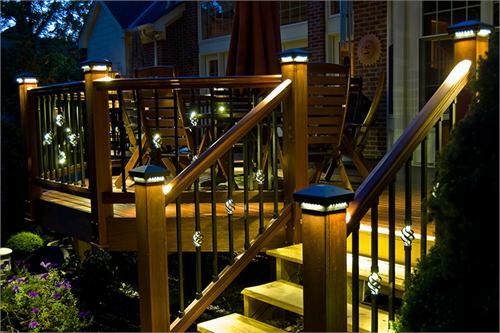 All our LED deck lighting products are crafted from quality materials and are designed to be both rugged and durable.